When you want to announce your pregnancy or reveal your baby’s gender, your love of sports can be a good way to show your unique personality in the announcement. Are you looking for a creative way to announce your pregnancy and share your love of sports? Whatever your sport or team, use an infant jersey to announce a new recruit to your family team. Many jerseys can be customized with your last name, a specific color and a custom number, such as the year your baby is due. Create a sports team “roster” with statistics of your family members, such as age, height and position on the team. Add the new baby to the roster to announce your pregnancy. The roster can even be created as a postcard by a stationery company that you can send to friends and family members through the mail. Take a picture with cleats for each family member, with the new baby’s cleats at the end of the row. This can be altered for a number of sports using different gear, including balls, helmets and jerseys. Use your love of your sports team to introduce the newest fan. Take a picture with team gear, like jerseys or hats. Include some gear for the baby, along with a sign that announces the newest fan and your due date. Create an announcement about the newest draft pick for your family team. Let your friends and family know when your little one is being signed by using the expected due date. Use a small water balloon filled with either pink or blue powder. Pitch the balloon to a target. When the balloon explodes against the target, your baby’s gender will be revealed. You could also have someone pitch the balloon to a parent and use a bat to reveal the baby’s gender. Use a basketball kit for revealing the baby’s gender. Have a parent shoot a basket and when the basketball bursts on impact, the baby’s gender will be revealed. Use a football kit for revealing the baby’s gender. Have a parent punt the football. When the football breaks apart on impact, the baby’s gender will be revealed. Use a powder-filled hockey puck and have a parent shoot a goal with it. When the puck comes ruptures on impact, the baby’s gender will be revealed. 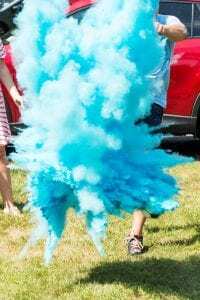 Fill a water cooler with either blue or pink confetti and dump it on the coach (the parents) to reveal the baby’s gender.